Robert Scoble and Christopher Longhurst chat about Electronic Health Records at Stanford. They discuss the importants of standards and interoperability of medical devices. Great video! My new Health Informatics books have arrived. 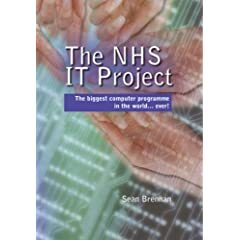 The first one I’m tackling is ‘The NHS IT Project’ by Sean Brennan. This book is a great read so far. I particularly enjoyed the vignettes from the point of view of Patient, GP and Consultant. The idea of discovering each morning that yet another patient has been placed on a inappropriate ward on the far end of the hospital and marching the whole medical team down there for a quick check up rang very true. I also remembered a conversation with my registrar who told me not to expect electronic patient records in either of our lifetimes… How quickly things have changed! We now have the NHS NPfIT ‘appearing like an army out of the dark’ to quote the book. The book goes on to describe the basic structure of the NHS and how the ‘legacy’ systems (many actually only recently introduced) formed the pre-NPfIT NHS IT landscape. Further explanation of the programme and it’s possible benefits and drawbacks are discussed in the latter sections of the book. The style of writing makes this a very interesting book to read and is highly recommended for anyone interested in health IT projects. If you want to read a sample of the book check out the preview on Google Books. I’ll post up some reviews here once they arrive. Any more recommendations for Health Informatics books or textbooks? Post them in the comments.